Rich Wittenauer was appointed Chief of Police on September 25, 2017. Wittenauer grew up in the Belleville and Millstadt area and graduated from Althoff Catholic High School in 1986. After High School he enlisted in the United States Marine Corps and served in the Marine Corps Reserves until 1994. During this time Wittenauer served in Operation Desert Storm in 1990-1991. 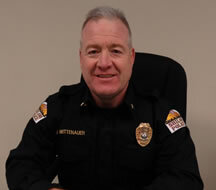 In 1994 Wittenauer graduated from the 54th session of the Southwestern Illinois College Police Academy and served the communities of Cahokia and Collinsville as a Police Officer, serving 23 years with the Collinsville Police Department. While at the Collinsville Police Department Wittenauer held several positions, including Patrol Officer, Field Training Officer, Detective, Patrol Commander, Detective Sergeant, Patrol/Administrative Lieutenant and Assistant Chief of Police. Some other responsibilities included Juvenile Officer, Defensive Tactics Instructor and Public Information Officer. From 1998 – 2001 he served as an Investigator with the Metro East Auto Theft Task Force. Wittenauer also served with the Greater St. Louis Area Major Case Squad of from 2002 – 2017 as an Investigator, Deputy Report Officer and Deputy Commander. He recently has taught as an Adjunct Professor at Lindenwood University in Belleville. In 2003 he was awarded the Medal of Valor by the Illinois Association of Chief’s of Police. Chief Wittenauer attended Belleville Area College (SWIC) from 1988 – 1989 and graduated from Western Illinois University in 1992 with a Bachelor’s Degree in Law Enforcement Administration. In 1999 he received a Master’s Degree in Human Resource Development from Webster University. He is a 2006 graduate of the Northwestern University School of Police Staff and Command in Evanston, IL and a 2012 graduate of the FBI National Academy in Quantico, VA.